Offering you a complete choice of products which include rail side car shakers and overhead car shakers. Railside Car Shakers are a permanently mounted vibration system designed to speed the loading and unloading of bulk material from railcars. The high-amplitude / low frequency vibratory energy developed by the drive mechanism has proven most effective in producing positive and complete material movement. Our Railside Car Shaker is very effective in loosening material from the walls of the railcar during unloading and in material densification during loading.Our Railside Car Shaker is also available in a rolling model. This model extends to contact and shake the railcar as it rolls by (railcars do not need to come to a stop during operation). The unit features a contact surface made of composite slider blocks reinforced with heavy duty mechanical tubing to withstand the rigors associated with contacting moving cars and to provide maximum service life.Both models are available in pneumatic or electric. They may also be operated from a remote location, and can easily be integrated into an automated process. Overhead Car Shakers are designed to facilitate unloading of open top, bottom discharge railcars. 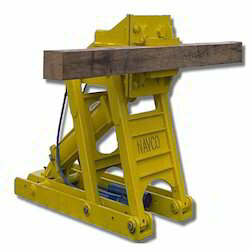 It is a heavy-duty unit designed for the most difficult unloading applications. 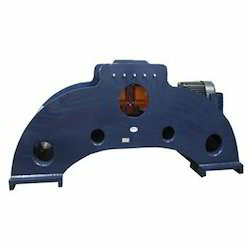 Our Overhead Car Shaker is constructed of stress relieved heavy steel plate and is designed for continuous 24 hour duty. The unit also features a cardan shaft that eliminates the need to replace or adjust belts. Looking for Car Shakers ?